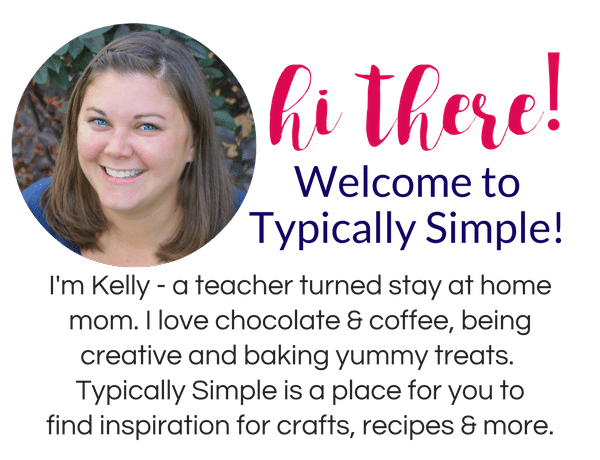 These days I am all about simple crafts. 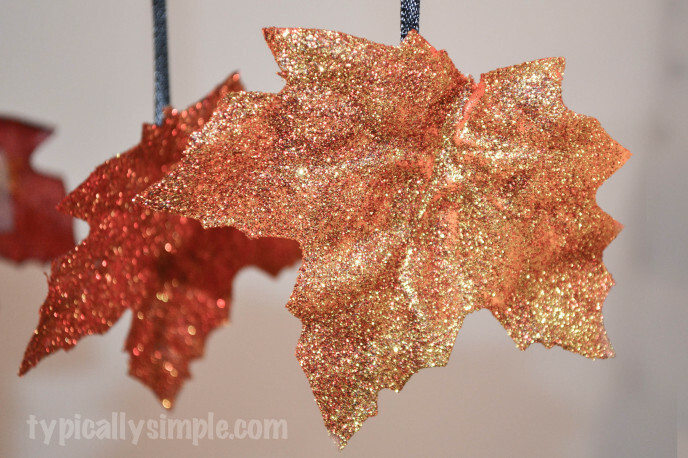 And these glittered fall leaves are as simple as they come! 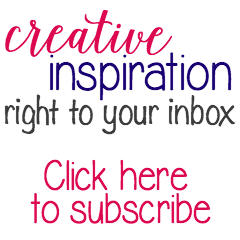 But the sparkly end result is perfect for decorating a bookshelf or mantel. I had most of the supplies for this project already, but I needed a reason to head over to the craft store. So I was off to find some glitter in fun fall colors! And the store did not disappoint, I found a pack of glitter with ten little samples that were all fall colors. Now to decide which ones to use! I started by brushing on a coat of Mod Podge to the front of the leaf. If you don’t have Mod Podge, just regular white glue will work. It might need to be thinned a little with water so it’s not too thick and makes the glitter clumpy. 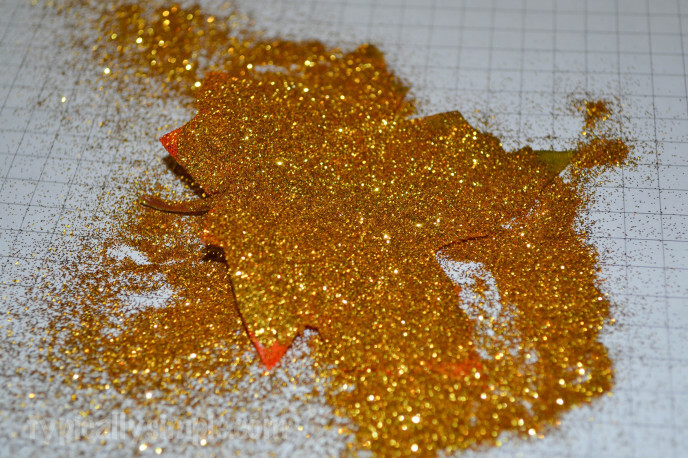 Sprinkle the glitter all over the leaf and shake off the excess. I put a piece of paper underneath so I can use it to pour the extra glitter on the next leaf. At first, I thought the glitter would be okay the way it was. 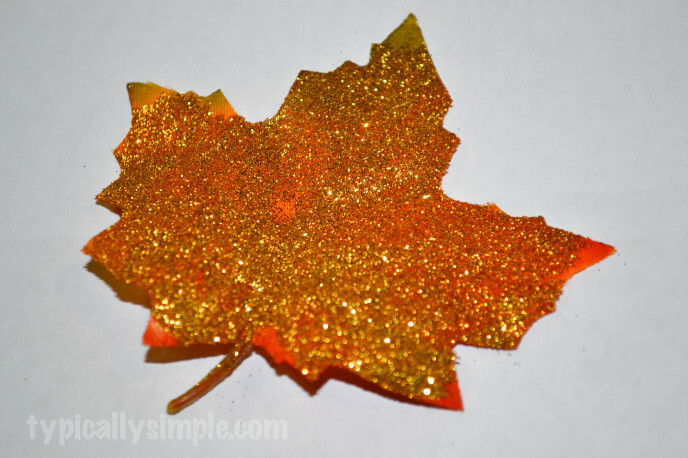 Until I picked up the leaf and glitter was sprinkling all over. 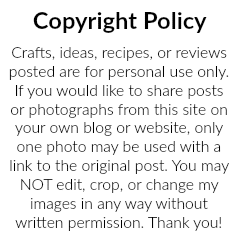 Since I didn’t want to be finding glitter in every crack and crevice around the house for the next however many years, I decided that another layer of Mod Podge would be needed. So using the foam brush, I brushed on another, thicker, layer of Mod Podge right over the glitter and let it dry over night. A little bit of the glitter still falls off, but not nearly as much as before! After they dried, I hung a few with some ribbon. Using my hot glue gun, I added a dab of glue to the back of the leaf and stuck the ribbon to it. Wouldn’t these make a fun garland for the mantel? I also left a few without ribbon to use them around the pumpkins in our front window. 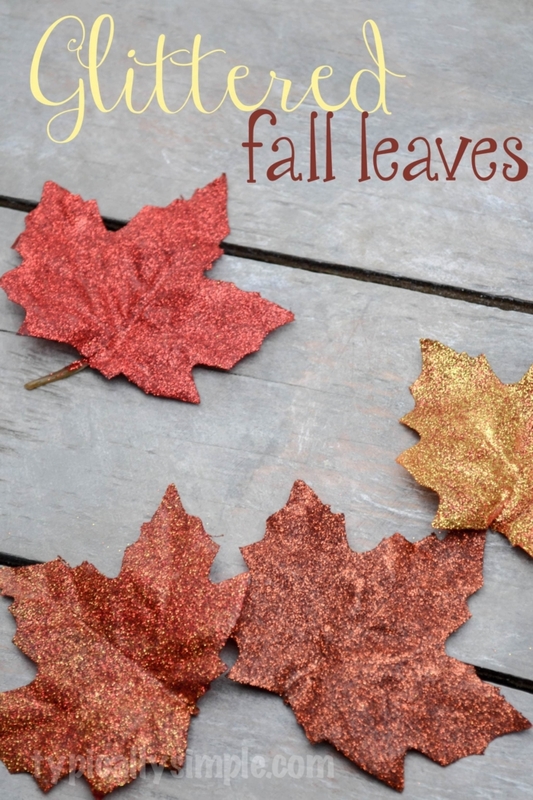 They will be great fall decor all the way through Thanksgiving! 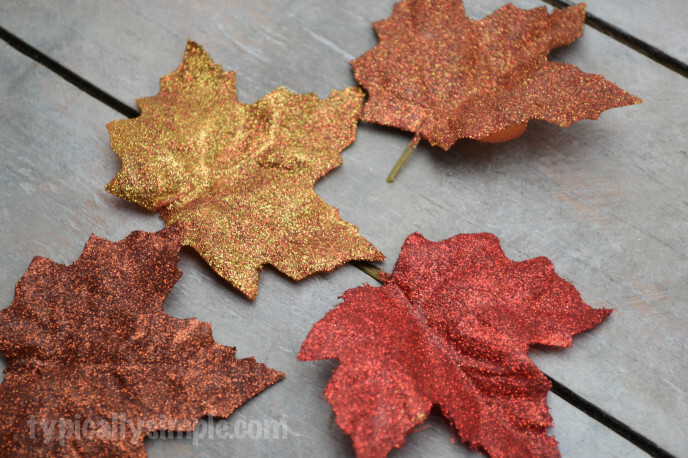 How fun would the glitter leaves look added to the Burlap and Ribbon Fall Wreath?